Lear uses different machinery and technology to optimize its different production and manufacturing needs i.e. 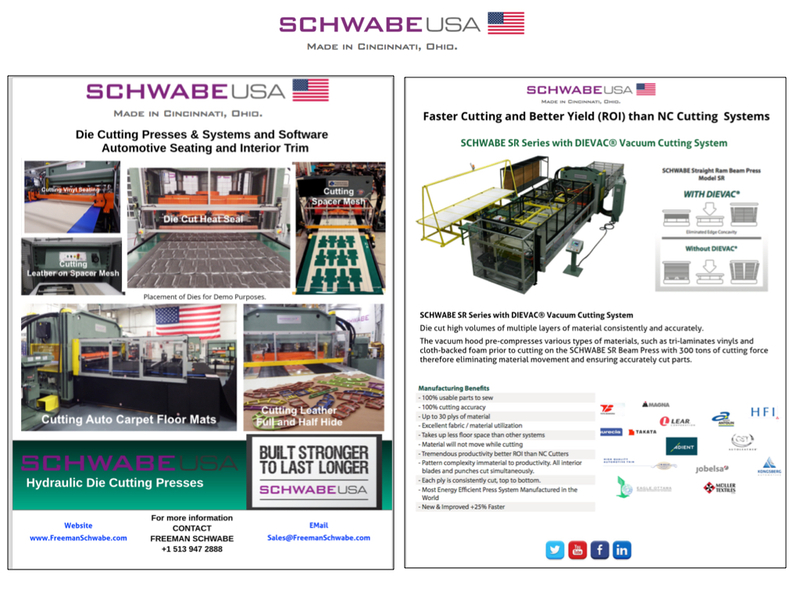 automated cutting machines for smaller niche production, and SCHWABE USA large format die cutting vacuum systems for its high volume / mass production parts manufacture. Most leading automotive interior trim and seating companies optimize their lean manufacturing in this way. An example of an efficient seating manufacturing cell is the embossing of seat covers using SCHWABE USA – Hydraulic Cutting Presses Made in Cincinnati, Ohio, USA. Schwabe USA Cutting Systems Auto Interior Trim CapabilitiesHigh Volume Cutting Trim Parts, Heat Seal Die Cut, Embossing, Mats, Cut Leather SCHWABE USA Cutting Systems Made In Cincinnati, Ohio, USAFreeman SCHWABE is a global OEM of the highest quality Hydraulic Die Cutting Presses / Cutting Systems and Manufacturing Software, including the world-renowned brand of SCHWABE USA presses built in Cincinnati, Ohio, USA. Lear Corporation LogoLear Corporation Logo LEAR CORPORATION - Leading Manufacturer in Automotive SeatingLear Corporation is the world’s most fully integrated manufacturer of the entire auto seat.